For the first time, the World Health Organization (WHO) published a list of “priority pathogens” which constitute a current and extreme threat to human health. 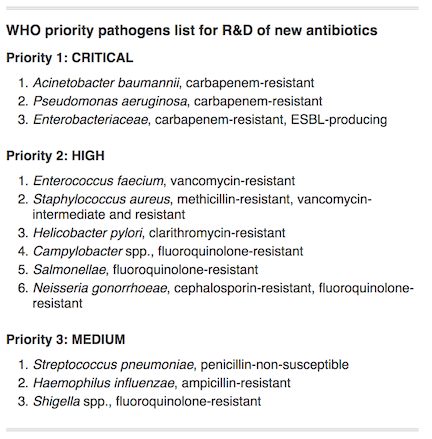 WHO is seeking to promote new efforts in the discovery and development of new antibiotics to address a growing threat of antibiotic resistance. Originally published by Richard Taylor at drugdiscovery.nd.edu on March 01, 2017.